Syrian Foreign Minister Walid al-Moualem stated in his address to UN General Assembly that the country reserves the right to respond to any violation of its territorial unity. He also underlined that creation of de-escalation zones in Syria is a temporary measure. "Notwithstanding its commitment to the memorandum on the 'de-escalation zones,' Syria reserves the right to respond to any violation by the other party. Syria also stresses that these zones are a temporary arrangement that must not violate the territorial unity of Syria," the minister said. He stated that the victory over terrorists in Syria is possible after the Aleppo, Palmyra, Deir ez Zor liberation. "My country, along with its steadfast people and its brave army, supported by our loyal allies, is marching steadily towards the goal of rooting out terrorism. The liberation of Aleppo and Palmyra, the lifting of the siege of Deir Ez-Zor and the eradication of terrorism from many parts of Syria prove that victory is now within reach," Muallem said. "For more than six years, Syrians have endured the worst and have made great sacrifices to defend their country in the face of a terrorist war of unprecedented brutality, which has spared no one and no-thing, targeting innocent people, services, the infrastructure and cultural heritage. 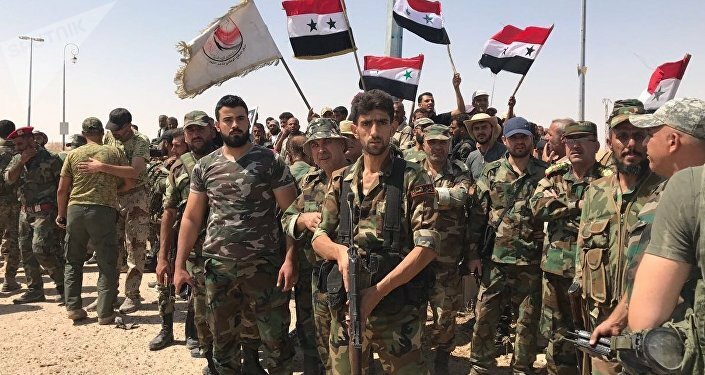 Despite it all, Syria is determined, more than ever, to eradicate terrorism from every part of the country, without exception, thanks to the sacrifices of our army and the steadfastness of our people," Muallem said. Damascus will increase its reconciliation efforts in order to restore stability in the country, Syrian Foreign Minister stated. "Syria is determined to scale up reconciliation efforts, whenever possible, because it is the best means to alleviate the suffering of Syrians and restore stability and normalcy," the minister said, adding that the efforts undertaken so far "have allowed tens of thousands of IDPs [internally displaced persons] and refugees to go back home" and helped improve the living conditions of a great number of Syrians who had fallen victim to terrorist crimes. In August, Syrian government forces, backed by Russian aviation, liberated the town of Al-Sukhnah, overlooking the strategic M20 highway which connects Deir ez-Zor with Palmyra, and are now moving northeast methodically flushing out jihadist militants on both sides of the highway. Meanwhile, the Russian Aerospace Forces and warships in the Mediterranean are clearing the way for the advancing Syrian government forces with airstrikes and cruise missile attacks. Walid al-Moualem expressed hope that Astana process will help the country to reach 'actual cessation of hostilities'. "We are encouraged by the Astana process and the resulting 'de-escalation zones' and hope that it will help us reach an actual cessation of hostilities and separate terrorist groups, such as ISIL [Daesh], Al-Nusra [Nusra Front, both terrorist groups banned in numerous countries] and others, from those groups that have agreed to join the Astana process," Muallem said in his address to the UN General Assembly. According to him, the US-led coalition against Daesh achieved no result in the fight against terrorism in Syria, killing more civilians than militants. He noted that the anti-terror fight in the country impossible without the coordination with the Syrian government, claiming that any foreign presence without its permission is illegal. "We have declared more than once that it is impossible to combat terrorism without coordination with the Syrian government. This is the only way to make real gains in the war on terrorism. Any presence of foreign troops on Syrian grounds, without the consent of the government, is considered a form of occupation, a wanton aggression, and a flagrant violation of international laws and the Charter of the United Nations," Muallem said. "While the coalition failed to make any meaningful progress against the terrorist group of ISIL [Daesh], the Syrian Army, along with its allies and friends, has been able to secure real and significant gains and drive out terrorists from large parts of the Syrian Desert," Muallem said in his address to the UN General Assembly. "The so-called 'International Coalition' led by the US, which was created three years ago to allegedly fight terrorist groups such as ISIL [Daesh], has killed much more innocent Syrians, mostly women and children, than terrorists and has destroyed vital infrastructure that Syrians have worked for years to build. It has also used phosphorus bombs and other internationally-prohibited weapons before the eyes of the whole world," Muallem added. The United States, Russia, Iran and other players are running out of room to avoid direct conflicts as territory ruled by the Daesh terrorist group (banned in Russia) shrinks and fighting becomes more intense, the private intelligence firm Soufan Group warned in a report on Friday. The report cited last week's shelling of Syrian government units, including Russian special forces, by US-backed Syrian Democratic Forces (SDF), as well as the bombing of SDF forces and embedded US special-operations units, by Russian planes as one example of conflicts that are likely to intensify. On September 21, Russian military spokesman Maj. Gen. Igor Konashenkov warned US commanders that Russia would target SDF and US personnel operating near the city of Deir ez-Zor, if Russian and Syrian forces continued to come under fire from those areas, according to the report. The foreign minister also confirmed Syria's commitment to Geneva process, intention to achieve progress in these negotiations. "The Syrian government reaffirms its commitment to the Geneva process and further progress on that track. This process has yet to bear fruit in the absence of a genuine national opposition that can be a partner in Syria's future, and as countries with influence over the other party continue to block any meaningful progress," Muallem said in his address to the UN General Assembly. He reaffirmed Damascus' readiness to accept UN experts for investigation on reports about chemical weapons attack in Khan Sheikhoun. "And as was the case after every accusation of this kind, we confirmed our readiness to receive and cooperate with UN investigation teams," Muallem said in his address to the UN General Assembly. 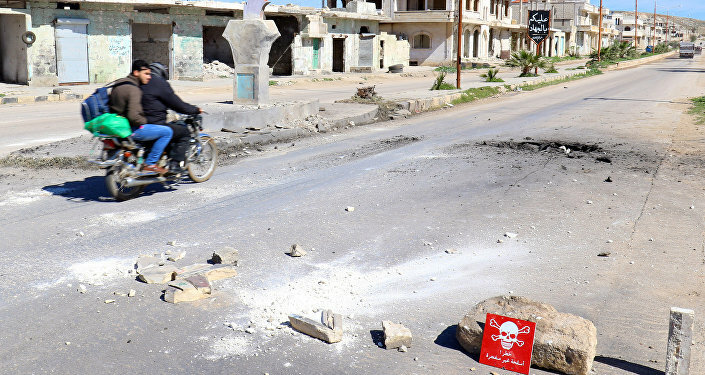 On April 4, the National Coalition for Syrian Revolutionary and Opposition Forces announced that several dozen people had been killed in a suspected chemical attack in Khan Shaykhun in Syria's province of Idlib. Four days later, the United States fired missiles at a Syrian government airbase in Idlib in response to the alleged attack, which the White House blamed Damascus for, albeit without providing evidence. Syrian authorities have refuted any involvement in the incident, saying that the complete elimination of the Syrian government's stockpile of chemical weapons was confirmed by the Organization for the Prohibition of Chemical Weapons (OPCW) in January 2016. Russia considers US claims of having evidence that Damascus used chemical weapons in Khan Sheikhoun unfounded.